Airport Parking Shop is an established online comparison website that’s just celebrated its 11th year. Over the past few years we have watched as mobile (and tablet) usage has soared from just 8% of our traffic in October 2011 to 44% in October 2014. We couldn’t ignore this trend and so earlier this year we took the plunge and completely rebuilt our site with a mobile friendly responsive design. Despite now having a very functional and mobile optimised site, with mobile use set to exceed 50% in the next few months, the next logical step was to offer our mobile users a more native experience so we decided build a dedicated app for both Android and iOS. Web technologies (CSS, HTML, JS) which most developers know well enough. Having looked at all these factors, we did some research and stumbled across Ionic. Ionic is a relatively new framework for building hybrid mobile apps (web technologies wrapped as native applications) and has only just gone from alpha to beta; that said, the repo has been starred nearly 11,000 times and the framework has over 13K followers on Twitter. Ionic is essentially a wrapper around the already very popular Apache Cordova framework (think PhoneGap), but comes with its own very powerful CLI tools and a wealth of documentation. Particularly impressive for such a new project. According to the Ionic website, the framework is “Performance Obsessed”. Performance issues were the main reason we shied away from PhoneGap and hybrid apps in the past, so this gave us some confidence that it was time to try them again. The framework also comes with a set of very well designed UI components, uses Bower & NPM and is written in AngularJS and SASS (optional), which are some of the most popular tools and frameworks out there and most likely key to Ionic’s popularity. This will start the Ionic server (with live reloading) and launch your newly created app in the default browser! The boilerplate file structure should be familiar to anyone who has ever used PhoneGap or AngularJS. All the app files, HTML, CSS & JS, reside in the www directory and all the Cordova plugins, SASS etc. in the app’s root directory. Inside www you’ll see a typical AngularJS app with controllers, templates etc. Whilst AngularJS knowledge isn’t necessarily essential, it will certainly help a lot and together with the excellent Ionic documentation the learning curve is minimal. 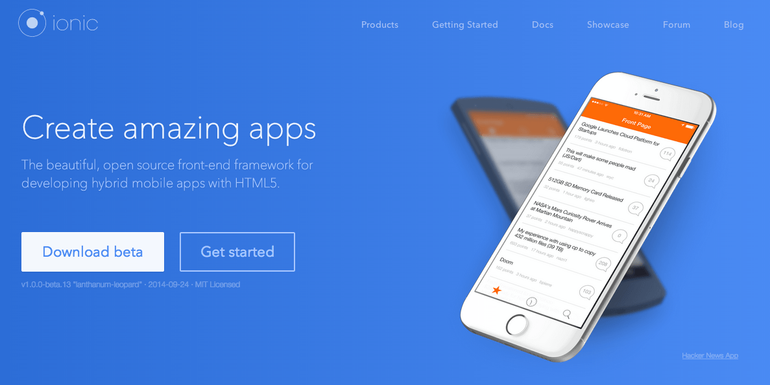 Ionic also provides a very good learning portal at learn.ionicframework.com and sites such as StackOverflow are full of helpful discussions and suggestions. Our app uses a simple landing page with a quote form that is made up of a select list and some date/time pickers. Next, we wrote the markup for our quote form and started looking at options for the date/time pickers, of which there are lots to choose from. That said, we didn’t really want to introduce another dependency such as jQuery, we wanted something optimised for mobile, and most importantly, we wanted whatever could be implemented the quickest and with the least amount of coding. They work brilliantly on both iOS and Android (4.4+) and required hardly any work. With the quote form hooked up to a controller and the picker values working, we were ready to start requesting some data. 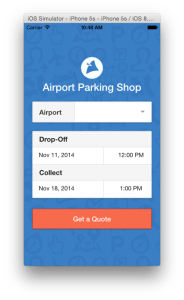 We wrote a very basic AngularJS service calling the Airport-Parking-Shop REST API which we already use for the results on our website. 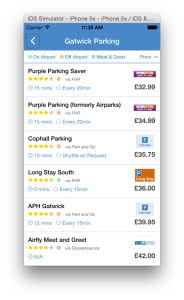 Finally, having a working quote form, API service and results view, we needed to find a way to link to car park providers’ websites where the user can either perform the booking or navigate back to the results whilst still maintaining the results and quote form state. Now, with our JSON results in, we moved on to create a single list view for displaying the results. Linking to the device’s browser was an option, but this would take the user several steps away from the app and just wasn’t ideal. Luckily, Ionic supports all standard Cordova/PhoneGap plugins, so we opted for the Cordova in-app browser plugin and again, with the help of the Ionic CLI tools, installing this plugin was very straightforward. Now that we had a fully functioning app running in a desktop browser, it was time to start testing on real devices and finally releasing our app to the masses! At this point we spent a little over a week writing the code and tweaking the UI to where it felt right and whilst this was all surprisingly easy, the real challenges came once we started testing outside the browser and getting our app ready for distribution. Ionic’s CLI simplifies testing on devices with 2 commands, namely ionic emulate and ionic run. To use these commands, you first need to add the platforms you intend to distribute to. This creates the platform specific builds in the platforms/ directory where the app will be compiled into its native form. Now, whilst the iPhone Simulator that comes bundled with Xcode launches quickly and runs the app as you’d expect, the same cannot be said for Android. The Android Emulator that comes with the Android SDK is quite simply unusably slow in our experience, so as an alternative we used a nifty app call Genymotion. The Genymotion app is quick to install and has a completely free option along with some paid options for larger groups of developers. Regardless of the price, this app helped us immensely with testing our app on Android and is simply a must when using Ionic for building Android applications. One thing to note is that the Genymotion emulator will not launch by using ionic emulate android, but rather ionic run android as if it was a real device. Once we were all set up and testing on emulators and real devices, it became quite clear that whilst the browser is fantastic for development, it’s quite far off the actual devices and we had quite a few bugs and fixes to iron out. Another big problem for us was implementing app icons and splash screens. First of all this meant making changes inside the ‘platforms/’ directory, which is something we really would have preferred not to do. Secondly, the way these icons and splash screens were implemented in Ionic simply didn’t match up to either Apple’s or Android’s specifications. We ended up using a really helpful site called makeappicon.com, which was able to give us at least a somewhat familiar looking set of icons to those that we found in the Ionic project. This is something that could do with some serious attention as it took at least 2 days for what should be a very small task. That said, it’s important to remember that Ionic is still in beta and I’m sure that with the current interest and contribution we’ll see this process simplified very soon. Two weeks from discovering the Ionic framework, we had an app that was running well on both iOS and Android and we were ready to build and distribute. Ionic has a very detailed guide to building and publishing for Android here, but nothing for iOS. Luckily building iOS via Xcode is very easy and, seeing as Xcode manages provisioning profiles directly from iTunes Connect, it is most likely the preferred solution regardless of how Ionic would approach this. So, after waiting for Apple’s ridiculously long review process, we had two apps live and it all took no more than 10 working days to complete. Whilst our app performs very well, it still uses CSS3 transitions and is more dependent on the user’s device than a native app would be. Something to bear in mind at least. All in all, hybrid apps are still just slightly behind in terms of performance, but Ionic certainly has done a fantastic job and to most the difference will be negligible. This is a tricky one, native apps definitely have the advantage when it comes to creating platform specific looking and feeling apps, but customisation can be more complicated. Hybrid apps on the other hand are really easy to customise, but creating a native look and feel can be much more challenging. Working on our app has been an absolute joy, even compared to the very good Xcode. The time it takes to compile a native app after every code change makes a really big difference and our two weeks would have certainly been a lot longer, not to mention if using Android SDK and Eclipse! There’s no question learning AngularJS and the Ionic framework is going to be a much easier task for the average web dev than learning the likes of Objective-C or Java, not to mention that the same web technologies will cover all the platforms you decide to develop for. This is a really big advantage, especially for businesses that need to deal with staff changes, and it is the reason hybrid apps exist in the first place. March 24th, 2015: The story continues – click here for how this blog post broke our website and how Nginx and Pagespeed helped fix it! How do you feel about Ionic’s future given the Angular teams announcement that 2.0 is an incompatible rewrite? Android Studio is IntelliJ based… Eclipse is a headache, I wouldn’t list it as a con for Android Development scene..
That said.. I’ve used Ionic, and it’s definitely a far better approach in terms of time-to-market that having to write two separate code-bases… one in Swift/Objective-C and one in Java. If you want to achieve more low level stuff, the Mobile OS specific code is going to be unavoidable… but it can be packaged up into a JS API, so UXI’s can get on with the presentation layer and more technical members of the team can get on with the low level integrations. Key points are that a) it could be another year away before it’s released, so shouldn’t worry about it too much yet, and b) Ionic are working closely with the Angular team, so any future updates should have good support. It may require us to do some refactoring, but given that it only took a couple of weeks to build this particular app, it shouldn’t be a major issue for us. If the app was bigger, it could be more of an issue. The 4.0 release of the Cordova cli tool added some nice support for Icons and Splashcreens. You can just put them in a folder and add their location and size to the config.xml file and the cli will put them in the right place inside the platforms folder at build time. Timing.. That’s a very welcome update which I’ll be looking at asap. Cheers. This is more about Cordova/PhoneGap rather than Ionic, but is core to the hybrid apps. Let’s say you wanted to add payment processing so you could pay for parking in your app. Let’s assume there aren’t any existing plugins or they aren’t mature/modern enough. Do you think you would develop the plugins and keep your app hybrid or switch to native? I think it depends entirely on what functionality it was and what the development time would be. Something complicated like payments.., maybe we’d go native. That said, there’s so many phonegap plugins available now that this is probably not a major concern. 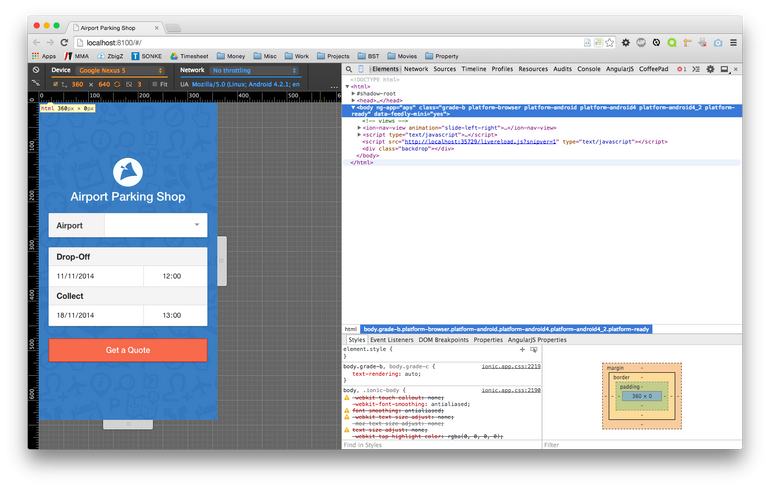 Ionic uses Cordova plugins for native features. Cordova is PhoneGap. Did you also investigate Crosswalk? I built an Ionic app last week, and the performance was insane on Crosswalk compared to the standard WebView, even on Kitkat. We had a very brief look at it, but we we’re happy with the Android performance given our limited time. Definitely something we’ll look at with the next release though. Did you consider Famo.us in your decision process leading to ionic framework being your solution for this app, and if so, what made you go the ionic road instead of the Famo.us one? Unfortunately we never found famo.us.. not sure how, but having had a few people suggest it, we’ll def be looking into it with our next app. Thank you to share your case with us. It help me a lot in some issues.